2 The difficulties being retired are you just can`t take a day off. 3 A man being retired is a full time job for his wife. 4 Life starts with the retirement. Congratulations! 5 If a colleague retires and time is not important anymore he often gets a watch as a present. 6 Retirement is great. You can do nothing all day long without being scared of being caught. 8 If you retire you will get a new boss. Your wife. 9 Sometimes it is hard to see if retirement is an approval for all the hard work or a punishment. 10 If a man retires his wife gets double so much husband but only have oft he money. 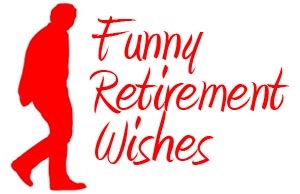 Please vote for your favourite retirement wishes.